Excellent picture, it is similar to fractal. Personally I do really like those colours ans shapes presented on picture. I want to ask You about retarder. Could You explain me what does it mean. if You prefer, please answer me in polish. All your photos are amazing. Of course I am joking. quarter, half and full "wave plates", slow light by that fraction of a 550nm wavelength. You can use materials like cellophane or "Sellotape" in the thickness you want (by combining) to get the best effect. CD wrappers work well. If you can arrange to rotate, or tilt, the "wave-plate" you can adjust the colours easily. Oh - I believe callous remover is often salicylic acid. Thak you all for comments ! 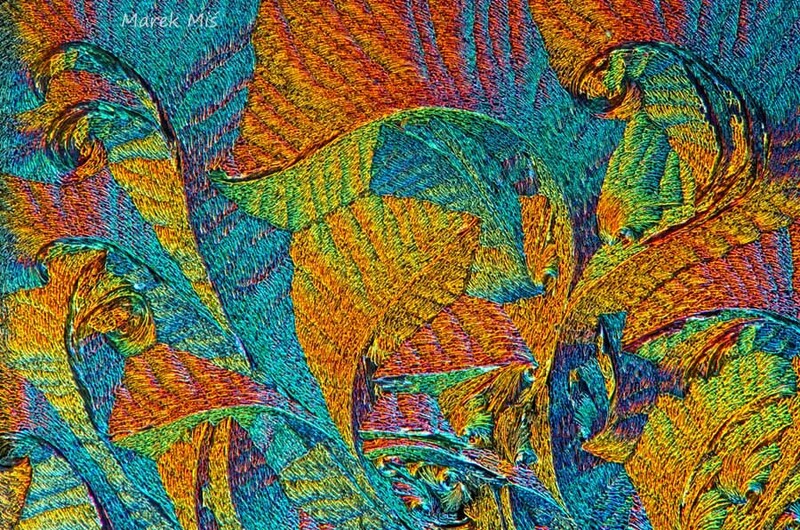 MASZEK, I am proud and happy that my articles caused you to start taking photographs using a microscope. Your Chaoborus details are very, very good ! If about the retarder, Chris has explained it very good. The another name which you can use for the reatrder is compensator (gdy kto? pyta mnie, po co to i jak to dzia?a, to najkrócej odpowiadam, ?e retarder modyfikuje ?wiat?o spolaryzowane w taki sposób, ?e uzyskujemy niemal nieograniczon? palet? barw). What is your set for taking micrographs (microscope, objectives, camera) ? Good luck in your new pasion ! ChrisR, Thank You very much for your answer. Great job. Links as well as diagram is very usefull and I think it will be helpfull for me. Thank You very much as well for your explanation and description of diagram. So, I think we should realize our conversations in English, at least here. Very unusual and beautiful image. It made me think of late 19th century paintings. Thank you for sharing this voluptuous image! It has inspired me to attempt something significant today. Thank you Walter and David for your kind comments !